I awake before the other cowboy campers and have breakfast. I sit on my spot in the universe and eat while stars slowly dim into the early morning twilight in the east. I am packed and hiking with my headlamp before everyone. There is another campsite two miles from here. “Maybe I can get to there before Braveheart leaves,” is my thought. I walk fast. My pack is light, resupply is coming soon. I freely drink my water making my pack even lighter. The next water is only ten miles ahead. I have plenty. Dehydration staved off to another day. Two miles is two miles . No matter how many miles I walk, a mile is still a long way when I'm watching the distance count down. It feels like forever. I walk along the ridge until it's light enough to turn off my headlamp. I drop my headlamp in my pocket and travel as quickly as I can. I arrive at the camp to find some hikers but no Braveheart. I look at the trail and mixed in with the all the other footprints are prints that matched her footprints from when we hiked together. There were lots of people between us but if they were hers we are only a couple of hours apart at most. The chase is on. A few miles ahead is the Chimney Creek campground where the fire was a few weeks back that closed the PCT. I'm walking as fast as I can. Braveheart hikes fast and I have to hike faster if I have any hope of catching up. I eat my snacks and drink my water. First to keep my energy up and stay hydrated but also to lighten my pack. A hiker passes me as I'm hiking down the hill. “Don't step on the tracks.” I wanted to yell, but I didn't, that would be weird. He stopped to rest in a few miles and I was in front again. I come blazing into the trail junction to Chimney Creek campground. There are about eight hikers sitting around chatting. Oh man, I've been following these people. One of them probably has the same shoes. I stand around chatting with them casually looking at their shoes trying to see their tread pattern. After surreptitiously examining the souls of their shoes I determine that none of them had the right shoes. I nonchalantly walk a few steps up the trail. There are her prints! With no prints covering them. “Got to go, see you down the trail,” I say over my shoulder and I'm off again at full speed. The next water is at Fox Mill Spring. I'll need to get water there. Braveheart prefers springs, maybe she'll stop there. Two and a quarter miles all uphill. Through rolling hills and switchbacks I climb. I am soaked with sweat, it's a warm day. I have followed people on the trail for many miles. It's interesting how you can begin to tell that you're getting closer as the tracks freshen up. The grooves and ridges left by the tread stand higher. The wind and breezes have not had the time to knock down the sharper details. I can tell I am getting close. I arrive at the junction to Fox Mill Spring. A Thru-hiker is standing there. I walk past him staring at the trail. The prints turn down to the spring but they don't come out. There are no more ahead. I turn down the trail and there she is standing by the spring. “How ya doing stranger.” I hear myself saying. I was exhilarated. I had accomplished what seemed impossible when I got back on the trail at Cajon Pass. At one point I was more than sixty three miles behind. Braveheart travels at her own pace. She didn't slow down or wait around. If I was going to catch up with the people I started the trail with I was going to have to earn it. I was elated. I soaked my shirt in the spring. I rinsed my pack towel. We chatted about where we'd been and who we'd seen and when. She said, “Are you ready?” “Yes” then she was gone. I tried to keep up for the first quarter mile or so, but I thought, “HYOH” (hike your own hike). Catching up to her was the big challenge. If she wants to go jetting off into the sunset, so be it. I slowed down to my exhausted pace. Somehow in the eagerness of catching up I had overlooked the fact that once I caught up I'd have to hike. I had used up all my energy and was drained. The next four miles were all up uphill and I puttered along as fast as I could while Braveheart disappeared over the horizon. I thought a bit and realized this was how we hiked before. It was the beginnings and endings of the day that it was nice to have someone to talk with. Eventually Braveheart stopped for lunch. This allowed me to catch up. She apologized for taking off like she did but her thoughts were on getting over the hill as fast as she could. I don't pay much attention to elevation profiles or distances or water. She does, I learn a lot from her trail savvy and efficiency. After lunch she let me be in front and we hike a lot slower. We talk and share about our different adventures and the people that we both know when we saw them last. It's hot and dry. Water is scarce, I never seem to have enough. I struggle up a long meadow, leading the way. Actually not leading anyone one, just following the trail. Eventually we reach the South Fork of the Kern river! Wow, it seems like an extravagant quantity of water all rushing by us as we near mile six hundred ninety nine. We stop, I empty my pockets and wade out into the middle of the rushing water. It's cool by not cold and I sit down on a sandbar and lay back until only my face is out of the water. The water rushes by me and flushes the dust and grime from me and my clothes. I could lay here for hours, but I don't Kennedy Meadows is too close. After my baptism we continue on. We hike all the way to Kennedy Meadows. Mile seven oh two, last stop before the high Sierra. While hiking up the road from the trail we met Proton, Mountain Man, Beardo, and Sweet Pea. 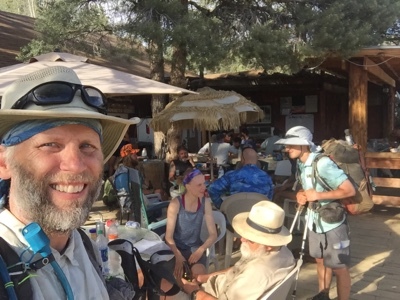 All Thru-hikers I hadn't seen since I was off trail at Cajon Pass. It was like coming home. These people I've known from the early days of my hike. This was my tribe. Walking into Kennedy Meadows is a special thing. As you walk to the General Store the entire crowd of Thru-hikers on the deck stand and clap and cheer for you. It's special to me because this is not just an audience this is a group of fellow travelers, sojourners who have experienced what I have experienced. They have felt the pain, the heat, the desperate thirst. They probably had wanted to quit but pushed through it and endured to here. When they arrived they were cheered too. I felt connected in a deep way. We had all shared the suffering together. There is an immediate affection and respect. Of all the places I've been so far Kennedy Meadows is the glue that binds us together in a common goal. We all like to think the hardest is behind us. The desert with its open vastness, desolation, heat and dirt is finally behind. We know that icy passes, numbingly cold stream crossings, and innumerable mosquitoes await us in the next few weeks but right now we are in the in between. We arrive in Kennedy Meadows after the general store closed. We can't access the special features and benefits of the store until morning. We get directions for the other hikers, who are hanging out on the deck of the store in spite of it being closed. The deck, I come to learn is a special place for Thru-hikers, where relationships are formed and deepened. We are directed up behind the store. Pick any spot you like it's free. So we wander back among the trees and find a couple of spots out in the open with late afternoon shade. I am so tired I could sleep in a junkyard, and basically we are. There are a bunch of old pieces of junk out back here including a derelict gas pump. I setup my tent and toss my stuff inside. I want to eat, I hear that a truck will show up and take hikers to Grumpy Bears. Grumpy Bears is a restaurant down the road about four miles. How long I have to wait is unknowable so I sit on the deck with the other Thru-hikers. Someone brings pizza, I grab a slice. Another thru-hiker hands me a closed bottle of beer. When the truck arrives Braveheart and I scurry out to the truck and pile into the bed in back. The floor of the truck has a number of tools laying about loose; wrenches, sockets, pliers, etc. one of the other hikers opens my bottle of beer with a socket wrench. Unfortunately the glass rim of the bottle stayed in the cap making the beer undrinkable without cutting my lips on the razor sharp glass. I have no cup so I hold the bottle trying not to spill any as we bounce and twist down the dirt road to Grumpy Bears. There are sixteen hikers in the bed and another four in the cab. The driver said he makes about thirty trips a day on a good day. You do the math. Grumpy Bears is an interesting place. It's more of a tavern. Like I know what a tavern is. But that is what they say they are. I stand in line waiting my turn to order. It's like standing in a barn. Not that ‘fake’ Golden Corral barn look. This was a barn. The floor creaked when you walked on it. The whole restaurant is run on a generator and propane tank. Off the grid. There's an alligator skin stretched out on a board above the bar. There are real guns hanging on the walls. I wonder to myself if some of them might be more than ‘decorations.’ Probably, I decide. There are cutting implements for animal husbandry. I am not sure what some of them are or what the purpose is for most of them. There is a pool table on wheels taking up a good chunk of floor space. The restrooms are ‘out back’, literally in a concrete block building. I order a cheeseburger and fries with a strawberry shake. Braveheart and I find a table. I steal a barstool from the bar, table table is bar height. I saw someone order ice water and they got a tall refreshing plastic cup full of ice water. I got back in line and got one of those. Meanwhile Braveheart visited the block house. My ice water was so so good. I kept going back to get more. What a novel thing, frozen water in your water. Braveheart came back chuckling. I see they have a mirror in there. “Why didn't you tell me I had dirt on my face?” She did too, it looked like war paint. I personally thought that it fit the whole Braveheart theme. They have wifi but I left my phone in my tent. The owner/waiter/chef comes out and asks by a show of hands who ordered milkshakes. I raise my hand along with about eight other thru-hikers. “The blender just broke. You won't be getting your milkshakes.” That's a tough break until I saw another thru-hiker walk away with a root beer float. I quickly order one of those instead. After stuffing myself with surprisingly good food based on the decor we head back out and sit in the pickup truck for the ride back. The sky is an incredible display of color and texture. The clouds lit underneath by the setting sun look like fake paintings of clouds painted by someone who doesn't know how to paint clouds. I think I might become and artist and paint pictures of clouds. Nobody can tell me I can't paint a cloud because they are so incredibly unusual, who's to say a cloud doesn't look like that? With the right conditions and lighting, who knows?